Partly based on his own experiences as a boy in Cardiff, Small Change is one of Peter Gill’s earlier plays, revived here at the Donmar Warehouse. It covers the efforts of two boys in 1950s Cardiff to remove themselves from their mothers’ apron strings, but also with the complex relationship between the two, struggling to grasp their true feelings for each other in a world where homosexuality is incomprehensible and illegal. But as it is a memory play, we also see the characters later in life and the action flits around the timeline showing how the past and present are inextricably linked and indeed their impact on the future. The extremely simple staging, just four chairs at random angles, a floating shelf on a brick wall at the back and an unadorned red raked stage means that the focus is squarely on the prose which is heavily poetical. But whilst there is no doubting the quality of the acting onstage and the obvious emotion invested in the depiction of unresolved homosexual yearning and the drudgery of housewifery, it rarely fully captivated the attention as it is just so very lyrical and Gill’s writing often veers to the elliptical and obtuse. This is partly due to the structure: the play constantly shifts around in time with repeated lines and recurring motifs echoing around but instead of being moving, I found myself getting increasingly irritated with the repetition. And there seemed something a little artificial about the evocation of working class language, a romanticism which was a little too rose-tinted for my liking. The acting is predictably strong, led by the incomparable Sue Johnston with her stoic and strong Mrs Harte contrasted with Lindsey Coulson’s much more nervous and despairing Mrs Driscoll, struggling under the weight of a large family and brutal husband. Matt Ryan and Luke Evans had a lovely chemistry as the two boys who never quite managed to chase the dream of love between the two, each following their own paths. On the one hand it was nice not to see full-blown ‘pretending to be children’ acting from these two but equally, the subtlety with which it was played meant that it was never abundantly clear just when we were in the storyline. Dull and uninvolving feels too harsh a description for this production given the strength of the acting, but I would struggle to recommend this to people as it ended up being quite a difficult play to like. 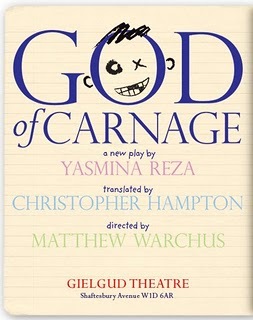 Yasmin Reza’s new play, God of Carnage presented here in a translation by Christopher Hampton, mines her familiar territory of social hypocrisy in skillfully dissecting the mutual disdain of two middle class couples. And as a four-hander, it has pulled together a truly heavyweight cast that is most impressive. Featuring 450 characters played by 27 actors with not a word spoken during its 100 minutes running time, The Hour We Knew Nothing Of Each Other is certainly an eyebrow-raiser and an experience, but is it really theatre? I’m still not sure. A Peter Handke play, although presented here by Meredith Oakes in a new translation which has caused a fair bit of mirth considering there’s no talking, so perhaps a new ‘interpretation’ might have been a better way of describing it? Pinter seems to be all the rage at the moment: Islington’s Almeida Theatre is now getting in on the act with a revival of his 1964 play The Homecoming. Present Laughter, the Noël Coward play about a middle aged matinée idol, arrives at the Lyttelton in a new National Theatre production led by Howard Davies. I was quite excited to see it, as I have not seen that much of Coward’s work on the stage at all and had heard wonderful things about Alex Jennings’ performance as Garry Essendine. Many a musical has received a facelift, but none quite so dramatic or misguided as Rent Remixed, setting up shop at the Duke of York’s. 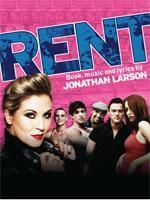 William Baker (director) and Steve Anderson (musical arranger) are perhaps better known as part of the creative team behind Kylie Minogue but are responsible here for reinterpreting Jonathan Larson’s much loved Rent for a younger generation. 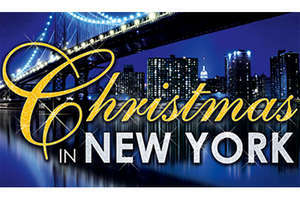 Continuing my obsession with all things Avenue Q or at least vaguely connected, we trotted off to the Lyric Theatre on Shaftesbury Avenue to Christmas in New York, a show of Christmas music ranging from traditional carols to thoroughly modern musical theatre numbers. The Q connection comes from Julie Atherton who alongside Paul Spicer is a founder member of Notes from New York, the company behind this annual show whose remit is to promote contemporary musical theatre composers. It was a highly enjoyable evening in which the talent onstage was clear with a range of West End stars, singing a mix of solos, duets and group numbers accompanied by a large choir giving huge glorious voice to several of the songs. Spicer and Atherton fronted up the ensemble but they far from hogged the limelight as many others, like Emma Williams, Melanie La Barrie and Oliver Tompsett, got their turn too. The only downside was our unfamiliarity with much of the material: it was akin to going to see a gig by someone you really like who just sings songs from a new album that you don’t know. Amongst the traditional carols and the Sondheim, Berlin and Rodgers number were intertwined with new composers like Michael Bruce, Charles Miller, Grant Olding and Ann Hampton Callaway whose material kind of passed me by a little without knowing more about it. There must have been over 30 songs performed in the big theatre and I would have preferred the stronger connection that might have developed in a more intimate venue. The musical version of Twas the Night Before Christmas was great fun though and it was a highly entertaining night altogether. A great demonstration of fresh new talent working on the stage and a nice alternative to the endlessly repeated usual Christmas tunes. Every year, my sisters and I are treated to a Christmas show by our Aunty Jean and with the scheduling difficulties and train timetables (they all live in the North-West), our choice ended up being Caryl Churchill’s Cloud Nine at the Almeida, a somewhat different choice to our usual fare, but one which proved to be enjoyable nonetheless. To be honest, I had to be somewhat dragged to see this show. I remember the film Shadowlands being out at the cinema and along with The Remains of the Day (also featuring Anthony Hopkins) neither one appealed to my teenaged self and that mentality remained with me even as this adaptation of William Nicholson’s play arrived at the Wyndhams Theatre. And boy am I glad that I allowed myself to be persuaded. I absolutely loved it and ended up crying bucketloads for almost the entire second half! For the few who don’t know the plot, it concerns classic English novelist CS Lewis and his late-developing romance with American poet Joy Gresham, its an unexpected relationship for both of them, starting as a correspondence and then blooms into marriage. However Lewis’ Christian faith is severely tested when Joy is diagnosed with terminal cancer and everything he believed in is turned on its head. 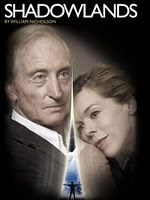 As the central couple, Charles Dance and Janie Dee are simply resplendent, utterly convincing in the portrayal of their relationship. Dee captures the strength of character of this feisty woman which hides a certain loneliness that she ultimately fills and Dance is just mesmerising with a quietly powerful and striking turn as a man who every certainty in life is changed, firstly for the better and then for the worse with a heartbreaking intensity. The play also has fun in showing the repressed nature of so many men of the era, especially in the cloistered lives of Oxford dons, typified by John Standing’s gruff professor and Richard Durden’s buttoned-up brother of Lewis. So an unexpected delight and one of the most moving things I’ve seen all year: highly recommended. I suppose I’m getting close to groupie status now, but what can I say, I really love this show! 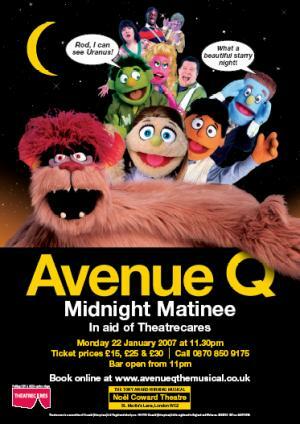 Again, not a huge amount to report in how Avenue Q remains a completely guilt-free feel-good pleasure and still as funny as ever, look in the archive for more in-depth writing. It was, however, pleasing to see that whilst Clare Foster was covering for Julie Atherton, I really didn’t mind too much and ended up being quite impressed by her performance. The debutants in the cast didn’t fare quite as well for me.